Both Nestle Purina PetCare and Milo’s kitchen are voluntarily recalling chicken dog treats nationwide due to the potential that the products may contain trace amounts of residual antibiotics that are not approved in the U.S. 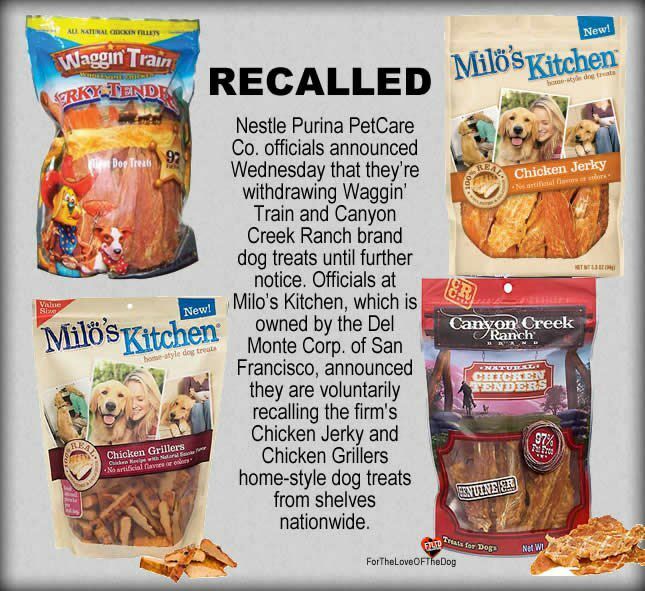 The recalled products include Purina’s Waggin’ Train and Canyon Creek Ranch dog treats, as well as Milo’s Kitchen Chicken Jerky and Chicken Grillers. Canyon Creek Ranch dog and cat foods are manufactured in the U.S. and are not included in the recall. On Monday, the New York State Department of Agriculture discovered that traces of unapproved antibiotics used on poultry had made its way into the Chinese-made food products. The antibiotics in question are approved by China and the European Union, but not in the U.S. Since 2007, more than two thousand pet owners in the U.S. reported dogs falling ill or dying after eating tainted treats made in China. Symptoms reported to the FDA include gastrointestinal problems like vomiting and diarrhea, as well as kidney problems, which can cause dogs to drink and urinate more than usual. The Food and Drug Administration continues to investigate jerky treats, but the agency said no definitive cause had been identified yet. FDA officials also said they were confident that the detection of antibiotics “do not raise health concerns,” and that they are “highly unlikely” to be related to the reports of pet illness linked to jerky treats, according to a statement published late Wednesday.